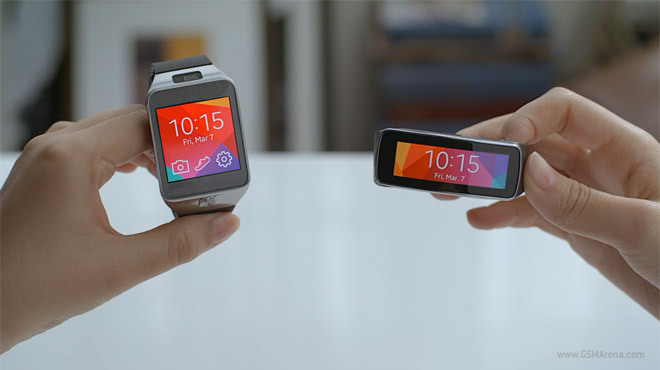 The Samsung Gear 2 and Gear Fit got the official hands-on treatment from Samsung to highlight their best features. Both devices can help you exercise with built-in heart rate monitors and display notifications from the phone. The more advanced Gear 2 can also function as a standalone device, by streaming music over Bluetooth to your headset as you run, for example. It also handles voice calls and can control your TV via the IR blaster. Both the Gear 2 and the Gear Fit are IP67 certified for water and dust resistance so you don’t have to be gentle with them. They also feature exchangelable watch straps for better customization. Those are just the highlights, check out the official hands-on below for more details. The Samsung Gear 2 is first, the Gear Fit hands-on starts at 5:45. You can also read our own hands-on from the MWC here.